The LP2 model from R+W. The new developments enhance the variety of sizes available for the model LP1 (single flex design with keyway connection) and the model LP2 (spacer style with keyway connection). All of the new sizes incorporate the proven benefits of the R+W LP couplings. The design is robust and compact, and depending on the version, can compensate for a certain amount of shaft misalignment. One feature of the new sizes is the optimized hub profile, which includes recesses in the area around the mounting screws. This helps to reduce the weight, resulting in a lower moment of inertia. The LP1 and LP2 series couplings are now available in 12 different body sizes, with torque ratings from 350 – 12,000 Nm. 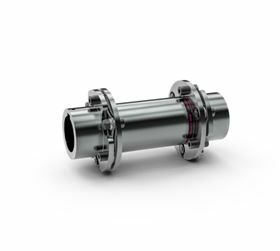 R+W says the new sizes allow engineers to select a better suited coupling for the application, which will result in a more cost effective solution. The LP Series disc pack couplings also include models with conical clamping rings (LP3), as well as a version that meets the API 610 standards (LPA). Custom couplings, for example non-standard spacer lengths, are available upon request.